Figure 7a from Kuzminsky (2013). Screen shot of 3D digital model with texture (on left) and without texture (on right) showing 15 facial landmarks and glabella. Cranium #264 from the archaic site of Indian Knoll, Kentucky. In her study, Dr. Kuzminsky concluded that 3D laser scanning technology is superior to older methods used by biological anthropologists. During her testing of 3D shape analysis and visualization tools she found one solution – Stratovan Checkpoint™ for medical imaging – that offers significant advantages for archaeologists, forensic anthropologists and museum conservationists. She began using Checkpoint in her own research, and believes the solution can benefit researchers in orthopedics, industrial design, surgical planning and other fields too. Stratovan Checkpoint is a set of state-of-the-art 3D shape analysis and visualization tools. It gives researchers better landmark-based tools that facilitate a deeper understanding of 3D anatomic structures. It provides 3D views of CT, MRI, PET and other 3D scans from a variety of modalities – including 3D surface scans – and enables the efficient collection of thousands of landmark points to provide precise analyses of complex 3D shapes. Dr. Kuzminsky is using Stratovan Checkpoint to study biological craniofacial variation in the early humans who peopled the New World. She is also using 3D methods and Checkpoint for bio-cultural studies of the standardization of cranial vault modification, which was a head-shaping practice common among prehistoric Andean communities. 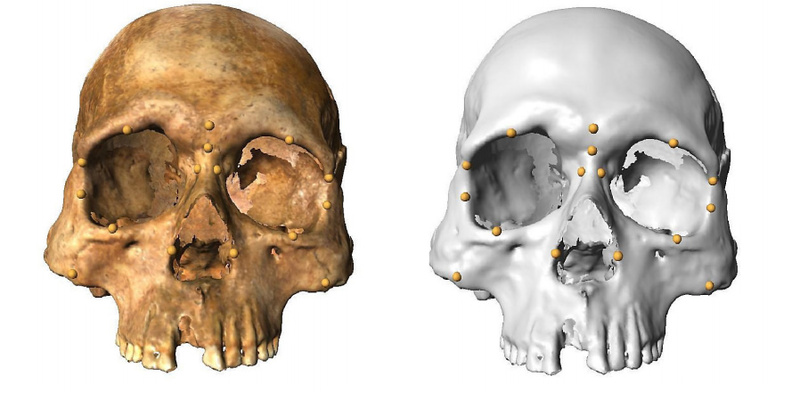 And, she used 3D models, measurements and cranial landmarks recorded in Checkpoint to analyze skeletal variation for forensic research as well. Checkpoint enables the collection of dense sets of data points on 3D structures so researchers like Dr. Kuzminsky can more easily analyze shapes using landmarks. It provides full 3D reconstruction to easily slice through orthogonal and oblique views. It can load both surface meshes and volumetric DICOM scans, and extract multiple surfaces from a DICOM volume. A custom tool in Checkpoint analyzes joint surfaces for congruence and/or changes due to treatment or disease. It gives researchers and clinicians a one-stop tool to efficiently do precise analyses of complex 3D shapes. Potential use cases for Checkpoint include facilitating a biomedical engineer’s design of a new prosthetics device, or to help an orthopedic surgeon study and compare congenital defects in patients. Checkpoint could enable an orthopedist to create a bone database to develop standards based on thousands of scans, then easily compare a patient’s scans with those in the database to measure deviations. Other uses include enabling maxillofacial surgeons to look at 3D scans of peoples’ faces to do deformity analysis on a patient, or to help plan a surgery. Checkpoint can also allow a healthcare professional to review a CT scan of a patient with a congenital bone issue. The software’s forensic applications are numerous as well. For example, Checkpoint can easily analyze bones from a criminal investigation, or accurately identify a victim from 3D bone and skull records. Checkpoint delivers the capability to collect the 3D landmark points that facilitate anatomic and shape analysis research in scores of different fields. Stratovan Checkpoint helps researchers in a myriad of fields more easily collect, analyze, manipulate and share data and images. This saves them time and money, and enables more accuracy and efficiencies in their work. Susan Kuzminsky, PhD, a bioarchaeologist at the Universidad Católica del Norte in Chile and the University of California at Santa Cruz, examines human skeletal remains from archaeological sites in North and South America. She wanted to find an easier, more effective, efficient and less expensive way to view, catalog and manipulate 3D images based on surface scan data generated with an HD laser scanner. Stratovan’s Checkpoint™ for medical imaging – a comprehensive set of state-of-the-art 3D shape analysis and visualization tools, provides better landmark-based measurement capabilities for a deeper understanding of 3D anatomic structures. The solution is popular among archaeologists, but has strong applicability to healthcare (surgical planning), industrial design (biomedical/prosthetics), and many other fields. Stratovan is a leading developer of next-generation interactive imaging software for the global medical device and diagnostic markets. The company’s solutions have broad application to disciplines beyond healthcare, such as anthropology and airport security. Stratovan launched in 2005 out of the Institute for Institute for Data Analysis and Visualization (IDAV) at the University of California, Davis.